I still consider myself a fair weather exerciser, so the main component of my active lifestyle is walking around the city (including to and from work). Unfortunately, although many of my dress shoes are quite comfortable, they just can’t take five miles a day on the Boston sidewalks. Thus, I’ve finally resorted to wearing commuter shoes. This puts less wear and tear on my fancy footwear. Plus, I’m motivated to get more steps in, since tennies are so darn walkable! Luckily, sneakers don’t have to scream goofy American tourist. In fact, when done right (see photos above) they can actually look quite chic. My trusty mint green Keds are filthy beyond repair (note to self: Scotchguard the next pair), so I splurged this red pair of New Balance kicks from J. Crew to achieve that urban-chic/woman-on-the-go look captured in the photos above. 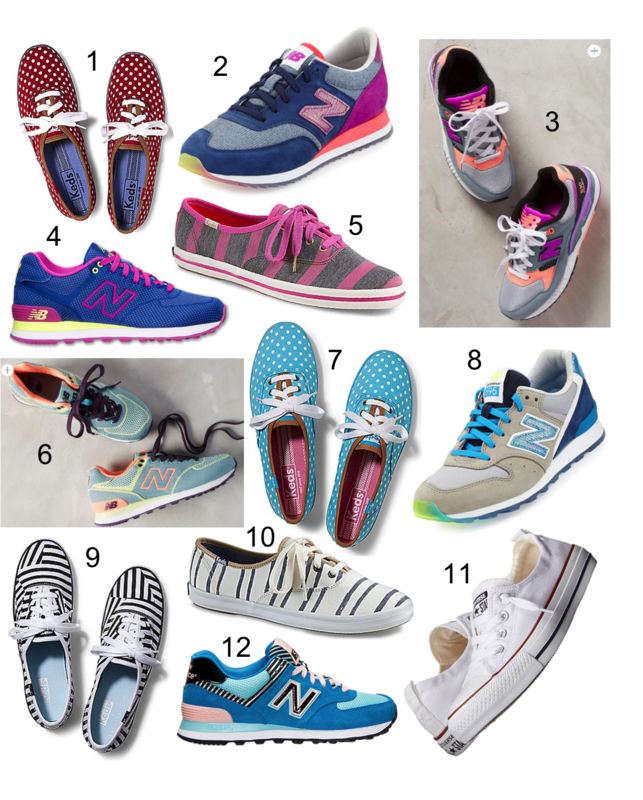 If you’re in the market for new commuter shoes, check out a dozen of my favorites below. They’re perfect for springtime strolls! P.S. I love my Toms, but they’re just not a practical option for walking around the city, as I tend to bust through the heel after less than ten wears. I like six, ten, and twelve! Super fun colors! !